Soup season is in full swing and I am loving every second. On Monday, I made a big pot of Vegetable Quinoa Soup and I can’t get enough. This healthy soup is just what I needed after our indulgent trip to California🙂 It is loaded with veggies-carrots, celery, zucchini, yellow squash, tomatoes, and green beans. I added quinoa to “beef” it up, don’t worry, there is no beef in the soup. 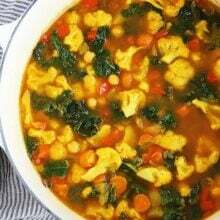 This soup is vegan and gluten-free…and one of my favorite vegetable soup recipes. I also made this soup to celebrate my dear friend Lisa because today we are throwing her a surprise baby shower! Surprise Lisa! I got together with my blogging buds (Brian, Gaby, and Marla) to plan a fun virtual baby shower for Lisa. We wish we could all celebrate with Lisa in person, but since we are all over the country, this virtual shower will have to do. Lisa and I are similar in so many ways. I really think we are sisters. We even craved the same things during our pregnancies-grilled cheese sandwiches, pancakes, and frozen yogurt/ice cream. Being pregnant also turned us off to vegetables, which is crazy for us. We are usually veggie loving fools! So Lisa might not appreciate this Vegetable Quinoa Soup just yet, but I hope her love for veggies will come back after she has the baby-mine did! This soup is perfect for new parents because it’s easy to make and you can eat it for days! Plus, it’s loaded with nutrients, protein, and warms the soul. 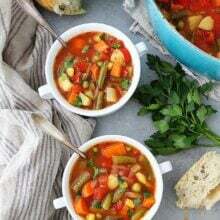 A healthy and hearty vegetable soup! Heat the olive oil in large, heavy-bottomed stockpot over medium-low heat. Once hot, add the onion and cook until tender, about 5 minutes. Add the garlic, and cook for 2-3 minutes. Add the carrots, celery, zucchini, yellow squash, and green beans and continue to cook for 4 to 5 more minutes, stirring occasionally. Add the vegetable broth, diced tomatoes, bay leaves, thyme, and basil. Reduce the heat to low, cover, and cook until the vegetables are fork tender, approximately 25 to 30 minutes. Stir in the cooked quinoa and season with salt and pepper, to taste. Serve warm. Note: To cook the quinoa, rinse 1 cup quinoa under cold water. Add quinoa, 2 cups water, and a pinch of salt to a medium saucepan and bring to a boil over medium heat. Boil for 5 minutes. Turn the heat to low and simmer for about 15 minutes, or until water is absorbed. Remove from heat and fluff with a fork. Pingback: Healthy(ish) Carrot Cake Cupcakes : Yes, I want cake. Perfect! I was actually just talking about making a quinoa salad for tailgating next weekend. If its chilly, maybe I’ll find a way to pack up quinoa soup instead! Congrats to the mama to be! Such a sweet post! I know Lisa will just love this soup! What a cute post and your soup looks fantastic! 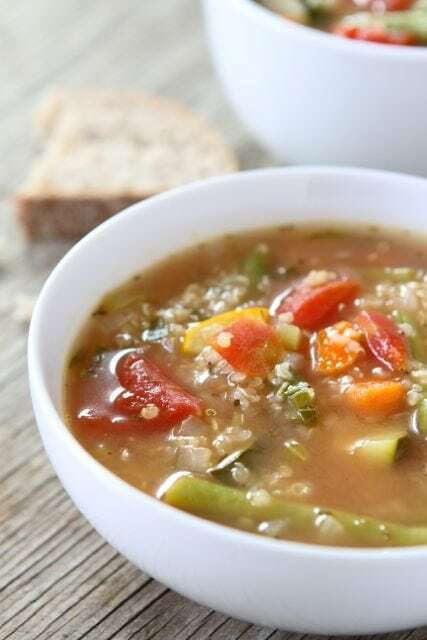 I just love vegetable soup and adding quinoa is a wonderful idea!! Lisa is a lucky girl! What a great baby shower you all have put together. This soup looks fabulous! This looks great for a cozy fall day! Now I’m off to check out what the others made! 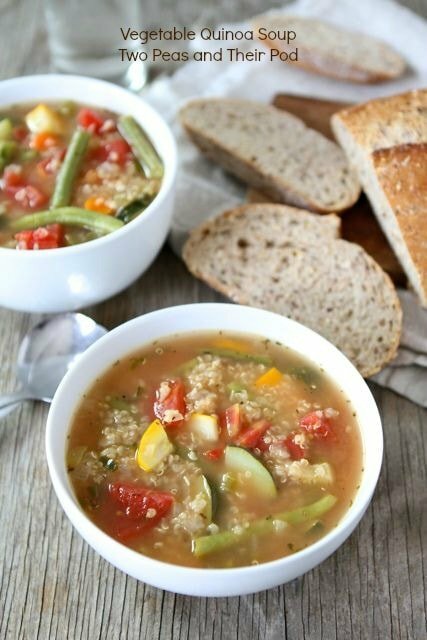 Quinoa in veggie soup? I’m all over this! Looks perfect! All of those shower dishes sound great! I LOVE this recipe! Makes me warm inside just looking at it. I’ll have to make this soon. It’s going to be in the upper 60’s today in Chicago but I’m sure it will be soup weather again by the weekend! 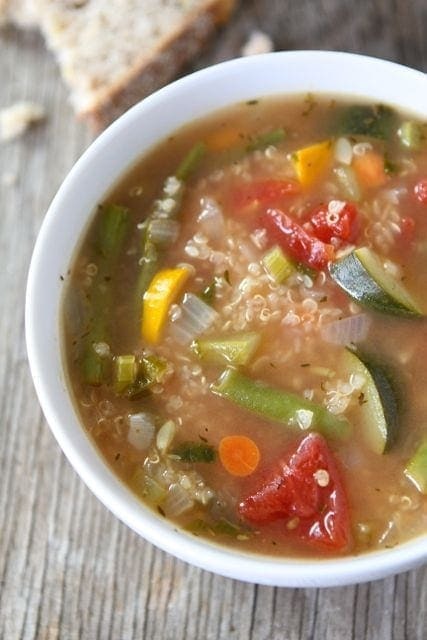 What a great idea to put quinoa in vegetable soup! Love it! Maria, we are all about the comforting fall soups! Yours looks incredible. Thanks for organizing the shower! i put quinoa in chili last year for the first time and we LOVED it!! definitely need to try this variation for when i’m needing extra veggies! We haven’t had much luck with Quinoa in the past. We haven’t tried a soup though. This looks awesome. Lucky Lisa – so cool! This soup looks fabulous! I just printed this and can’t wait to try it out!! It looks so warm and comforting. Love all of those veggies too. Healthy and delish. Lisa is going to LOVE this. So I got up at 1am my time to make sure my post had posted for the shower, and your recipe was the FIRST one I looked at. Then I wanted vegetable quinoa soup in the middle of the night. It looks that darn good. This soup looks delish, I love all the veggies! I just discovered red quinoa. (They have it at Winco). I have been substituting red quinoa in my salad and soup recipes lately and I LOVE it! You should try substituting red quinoa in this recipe! It would be fantastic! Try it, you will like it! What a comforting bowl of soup! This is a terrific soup for anytime of year. This looks so good – and so Peruvian (they make great veggie soup there, and they put quinoa in it!). Quinoa is a genius addition to vegetable soup. LOVE this! Awww….what a lovely thought! The salad looks gorgeous! Ahhhh, soup season is upon us. Would love to add this to my mix! This looks like a soup that’s begging to be made in double and triple batches, and frozen for future meals. As you said…perfect for a new mama. Congratulations, Lisa! What a great way to celebrate Lisa’s first baby! I would love a bowl of his hearty healthy soup! This sounds so wonderful! You and Lisa seem to have a wonderful friendship. I’m a few months away from giving birth myself and I’m excited to try this soup (thankfully, I’ve still been loving my veggies). How exciting!! (both the soup and the coming baby). I can’t imagine not loving veggies for even a day let alone NINE MONTHS. Crazy. That soup looks delicious! And, healthy too! I love this soup! Sadly it’s too warm here in San Francisco for soup…but once the weather starts to cool, I’m all over it. Especially the addition of the quinoa. Yay! It was freezing when I woke up this morning – it looks like it’s going to be a perfect day for soup! Perfect!! I have these exact veggies that need to be used….making this tonight! 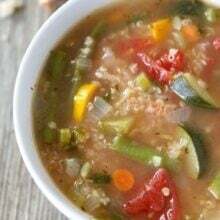 Mmm, veggie quinoa soup! Gotta give this one a try sometime! Just wanted to quickly mention that this newsletter I subscribe to is putting on a recipe contest for the holidays. It would be great to see what the readers here can come up with! This soup is SO right up my alley. Give me quinoa and veggies and I’m a happy girl! My sweet mother made this soup last night, and it was delicious! I’m having leftovers for lunch the rest of the week! It’s very comforting yet healthy. I am so glad you enjoyed the soup. Enjoy the leftovers! DELICIOUS! Perfect amount of seasoning. I’ve never used thyme in soup, but it gave the veggies a wonderful flavor. I’m always looking for vegetarian recipes for my friends, and the addition of quinoa made it a perfect soup for me, too. Thank you for posting the recipe. Mmmmm, I love quinoa in soups! It adds such great texture, heartiness, and a boost of protein. This soup looks just gorgeous. I’ve bookmarked the recipe to try. Thanks so much for sharing! Yum! This soup looks perfect for fall weeknight dinners! I didn’t know quinoa was gluten-free, good to know! This soup looks really good! Good alternative to a chicken noodle soup for the flue season! We just had a cool front so maybe this will be Sunday’s dinner! I do not like many vegetables at all, but I saw this and wanted to try. I am trying to eat healthier and more real foods. I’m not sure what I did wrong, the recipe calls for 2 cups of cooked quinoa, but on the bottom where it tells you how to cook it only calls for 1 cup. I ended up cooking 2 since that what recipe stated. So I ended up with a lot of soup, more than the 6-8 servings. Since I’m not a big fan of veggies, I have never made vegetable soup, not sure how it should taste, but I felt like it was bland. I’m taking some to work today to try and see if maybe it will have more flavor. The note at the bottom of the recipe is how to cook the quinoa. You need 1 cup of uncooked quinoa-which will make 2 cups of cooked quinoa. Sorry if that was confusing! Thank you. It was my fault on the confusion, I do not claim to be a cook by any means, so I call myself a recipe follower. I tried it again the next day and it is better, next time I will know to use a lot less quinoa! I just made quinoa chili, which was incredible. I will definitely be adding it to more of my soups! 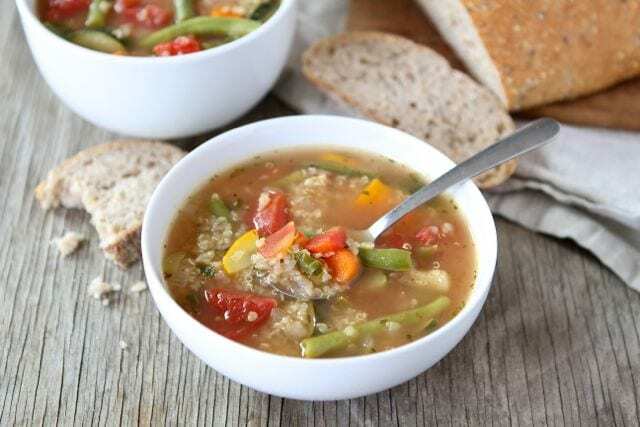 We had this for dinner tonight, it was so easy to put together and really good – quinoa in soup is awesome! I know it’s a ‘sloppy’ method, but results are similar. 1 less pot, and easier veggies. love all the different veggies! Maria – I’m totally in need of a healthy soup like this after all my travels. Thanks for sharing! I have frozen cooked Quinoa with great results, so the next time I make this recipe, I’ll make a full batch and freeze some individual portions to serve with sandwiches for a quick meal. Yum this sounds so good. I can’t wait until the weather gets cooler. This soup will be top of the list for sure. You girls and your sweet little families are adorable!!! LOVE this gluten free soup, Maria! Hope you are well; miss you guys! I love soup season! Especially when you get to celebrate with a soup such as this! Quinoa is a nice, fiber-rich addition. I’m also loving the wide array of veggies you used. Yum! Delicious! Just discovered quino through your recipes and I am a big fan. This will be a staple this winter. Pingback: Dinner 7 « What's For Dinner? I cannot tell you how perfect this soup is. My grandmother was having surgery and I wanted to make a meal for her and my grandpa. I came across this recipe and it’s perfect for them. It’s simple and healthy and there’s no meat/dairy in it. I also made them some of your rosemary corn muffins and they loved them. Thanks so much for posting this. If you freeze this, do you freeze it with or without the quinoa? But I’m not much of a basil fan (I know I know). I was going to leave it out, but is there something you’d sub in instead? can you just cook the quinoa by dumping it into the soup? thanks! This is one of the best vegetable soups I have had in a long time. Perfect for this time of year, you really nailed it! This recipe was a savior to us this weekend! I loved it so much that I shared a link on my own blog 🙂 Thanks for sharing! Happy Tasty Tuesday! 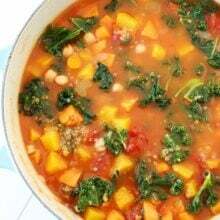 We love this recipe and it is featured on our Tasty Tuesday – Soup and Stew recipe round-up this week! Thank you for sharing! I just made this soup yesterday and love it. It was quick and easy to make and so delicious. Thank you. Awesome recipe! Easy & perfect for a chilly night! If you make it in a slow cooker, don’t cook the quinoa first. Quinoa ratio: 1 cup uncooked quinoa to 2 cups water. I hope that helps! Tried this today for a potluck, and it was a hit! Yum! i’ve been looking for quinoa recipes to try out and this one looks great! might sub okra for green beans though. This soup was absolutely lovely, so tasty and healthy. As a bonus my sister is vegan so I was able to share this with her for lunch! Oh my I am going to bookmark this! I’ve been having a hard time with my induction cooking stuff and just in general cooking a good veggie soup! I just had to come and tell you how much my family adores this soup. It’s amazing! We made it a few times last fall/winter season and I have to say its my favorite soup of all time. I stared to call it “magic soup” to the kids. Loaded with veggies and protein, clean, nutritious, and it just makes your body feel good after you eat it. Magic. The one thing I have done that makes this a bit more appealing to the littles is, blending it up a bit at the end (after removing the bay leaves of course) and we sometimes top it with a bit of fresh grated parmasean/romano/asiago chesse. Whatever we have on hand. Thank you for the wonderful recipe!! I made this tonight! So good! Just lots of chopping. I cooked the quinoa while the veggies were boiling away. Worked great! and it is super delicious! Fantastic recipe. Made this yesterday for lunch – loved it!! Thanks for posting!!! why not cook in the quinoa in the soup? Loved this recipe. Reminds me of a vegetable soup (with quinoa) that we had at a local restaurant that I’ve been trying to replicate! It’s perfect for this cold, snowy winter we’re having! Thanks for sharing. I love this soup, I used a half a red pepper as well and a can of diced tomatoes with green chilies in it. Delicious gives a good heat. Will make this more often! i made this for lunch today. all i had on hand for veg was carrots, 1/2 a sm onion, 4 roasted garlic cloves, celery, frozen corn and green beans. it turned out great! so goes to show this is a very flexible soup. husband thought it was great and was glad for leftovers. will go in my soup recipe book! I made this soup for dinner late last week. The only thin. I did different was change the tomatoes to crushed and I use kitchen basics unsalted broth. Plus whatever amount of quinoa that get made from doing the instructions above I used all of it so we didn’t have to find a project for the left overs. It was yummy and even better reheated a couple days later. I am thinking about trying to freeze it and see how it comes out. I am diabetic and this has lots of good veggies and the carb count is great for a really good sized serving. Will make it again soon. This soup was great! It really hit the spot! Thanks so much! I made this for dinner tonight and we love it! This is a first having quinoa in soup and it’s delicious! Yay! Glad you liked it! We love quinoa in soup! Delicious! I didn’t have fresh green beans, so I used canned white beans and put them in at the same time as the quinoa. I also added some kale. Delicious. I made it for guests and was nervous with never having made it before, but much to my delight, it was wonderful. Thank you! How would you adapt this to the crockpot? I finally had to leave a comment. This will be the third time making this soup in the past year or so! It is so healthy and so delicious! Definitely a great way to get your veggies in! Thanks for sharing it with us!! You are welcome! Glad you like the recipe! made this. Turned out good! Hello Maria. Looking this recipe very tasty and delicious. I had made this soup on my younger brother birthday. Everybody enjoys it so much. Thanks for sharing. I’m so glad I’ve chosen vegetarian diet, so I found lots of these delicious foods and recipes! This soup was positively delicious! I could not stop eating it! I will make it again and again!